During the nineteenth century the United States underwent a dramatic westward expansion, but perhaps no single event stimulated this mass migration more than the 1848 discovery of gold at Sutter's Mill in California. Hundreds of thousands of Americans were struck with "the fever." While some chose to sail to California on the famed Clipper Ships, the vast majority of gold seekers journeyed overland from the Missouri River feeder towns of Independence, St. Joseph, and Council bluffs. Through Nebraska, most travelers followed the established Oregon Trail which also became known as the California or "Forty-Niner" Trail. The Forty-Niner Trail entered Thayer County near present-day Alexandria and followed the Big Sandy Valley where water, wood, and grass was available. After crossing the Big Sandy near Belvidere the trail proceeded in a southwesterly direction to the banks of the Little Blue. After the establishment of Thompson's Station a few miles south of Belvidere the trail followed the Eighteen Mile Ridge across Thayer County. The route was later used by the Pony Express, freighters, overland stage companies and the railroads. The trip to California was long and arduous, with disease, heat, lack of water, and Indian threats the constant dangers. The call to adventure, possible riches, or a new home in a new land encouraged these hardy pioneers to make the journey along the Forty-Niner Trail. 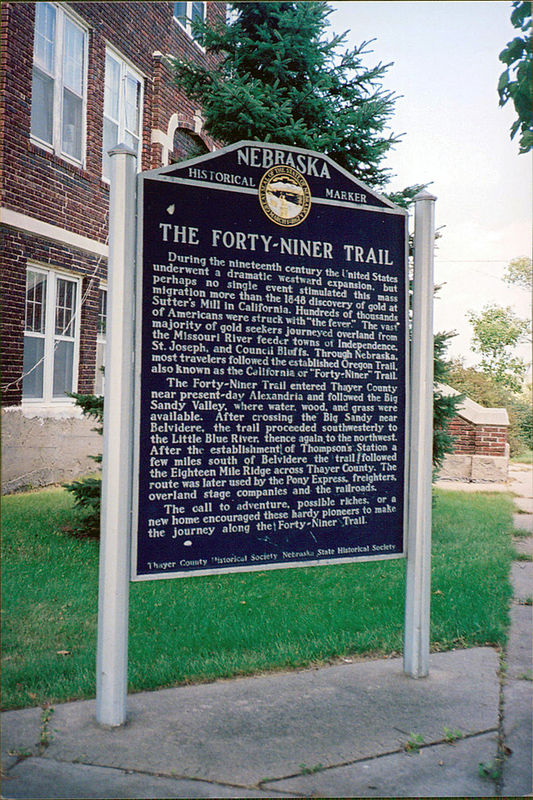 “The Forty-Niner Trail,” Explore Nebraska History, accessed April 19, 2019, https://mynehistory.com/items/show/491.